Situated only a short train ride from the Brisbane CBD, our spacious, well-appointed apartments offer the perfect base for your next city trip. Take your pick from a selection of one, two and three bedroom apartments and loft apartments, all self-contained and complete with air conditioning, WiFi internet access, cable TV and private balconies with superb city views. 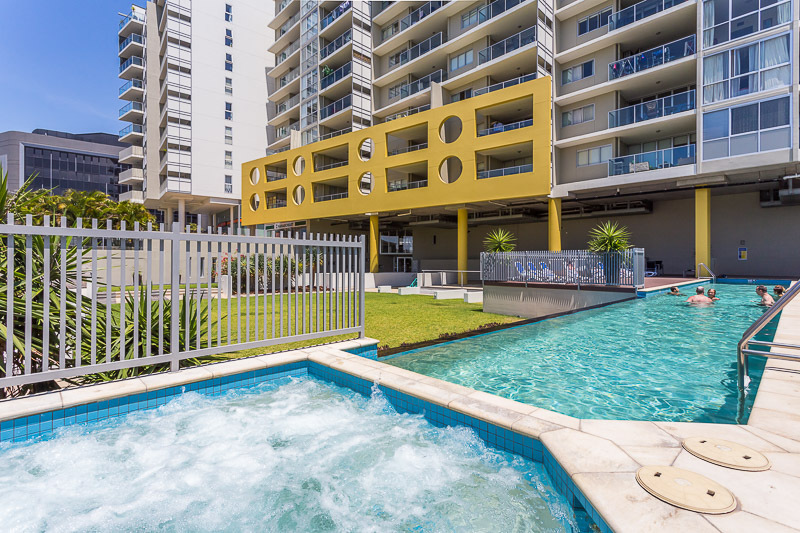 You’ll also enjoy access to the premium range of guest amenities at Serviced Apartments Brisbane including a heated outdoor swimming pool, heated spa/Jacuzzi, sauna and modern gym/fitness room. Our enviable location in the popular inner city suburb of Spring Hill puts Brisbane’s best shopping, dining and cultural attractions right at your fingertips. Make your way to Queen Street Mall, just 10 minutes walk from our Accommodation Spring Hill Brisbane, to browse a great selection of family favourite shops and designer boutiques, sample exotic delicacies at the international cafes, bistros and restaurants on Little Stanley Street at the beautiful Southbank Parklands, or check out the latest work of up and coming fashion designers at the markets at James Street. When it’s time to escape it all, head into one of the city’s many public parks and gardens to picnic in the cool shade, or simply sink into the heated spa at our Brisbane Hotel Accommodation. When it’s time to eat, you can cook up delicious family meals in your apartment’s fully equipped modern kitchen, or take your pick from one of the great restaurants in the local area close to Oxygen Apartments. Book your stay at our Oxygen Apartments Brisbane now and start planning your break today! Ideal for corporate guests that need easy access to the CBD, as well as couples, friends, and families who want to explore all that the city has to offer, our Serviced Apartments Brisbane are spacious, contemporary and well appointed with all the comforts of home. With the excellent train, bus and ferry links nearby, you’ll have no trouble exploring all that Brisbane and the local area has to offer. Catch concerts from international artists, sports expos, trade shows and much more at the Brisbane Convention and Exhibition Centre or RNA Showgrounds. Head to the theatre district at the Southbank Parklands to see the most interesting Australian productions before anyone else, or spend a long, leisurely afternoon browsing the Queensland Museum. Our Brisbane Accommodation is made up of spacious, fully self-contained apartments designed with the perfect self-catering break in mind. After a busy day meeting colleagues in the CBD, unwind with a relaxing lap of the 25 meters heated outdoor pool, sweat it out in the sauna or burn off excess energy in the onsite gym/fitness room. Those who prefer to relax in the outdoors can head out to one of Brisbane’s beautiful parks and public gardens to discover a green haven in the heart of the city close to our Holiday Apartments Brisbane. Alternatively, retreat to your apartment’s private balcony with a cool drink and take in great views over the city. Brisbane is a top commercial center and also a locality endowed by nature. There is plenty of cultural and natural attraction capturing the interests of tourists across the globe. Now tourists can splurge on other activities and sightseeing than spend a fortune on hefty hotel bills. Discover the splendid attraction of Brisbane such as River links or River city- an ideal spot for canoeing. If a nature lover, do not miss out on the Lone Pine Koala Sanctuary, Somerset and Lockyer Valley with waterfalls. Also, do not miss out on a trip to Moreton Island for feeding wild dolphins. You can also opt for snorkeling around the Island. Oxygen apartments are the most affordable and comfortable apartments in Brisbane. After opting to stay in these apartments, most tourists and business travelers plan long-term stay in the hotel accommodation, especially for its multiple facilities and affordability. There are plenty of facilities such as Wi-Fi access, a well-equipped kitchen with dishwasher, large fridge, laundry service and air-conditioned rooms. Relax among these amenities. Also, if you are bored, take a dip in the warm swimming pools or bask by the poolside sipping your favorite beverage or cocktail. You can also relax in the rooms and play the channels provided by cable TV. Oxygen apartments ensure that you do not miss out any essential facilities instead enjoy thoroughly your vacation. Now the affordability and top amenities provided by these apartments are enticing travelers to revisit Brisbane and explore its attractions. They are eager to plan new adventures in the city and enjoy once again! The clean and hygienic interiors, well maintained large rooms, sanitation, good maintenance are all the basic aspects of the Oxygen service accommodation turning it to be the popular choice for long-term stay in Brisbane than the cluttered hotel rooms lacking space and limiting freedom.